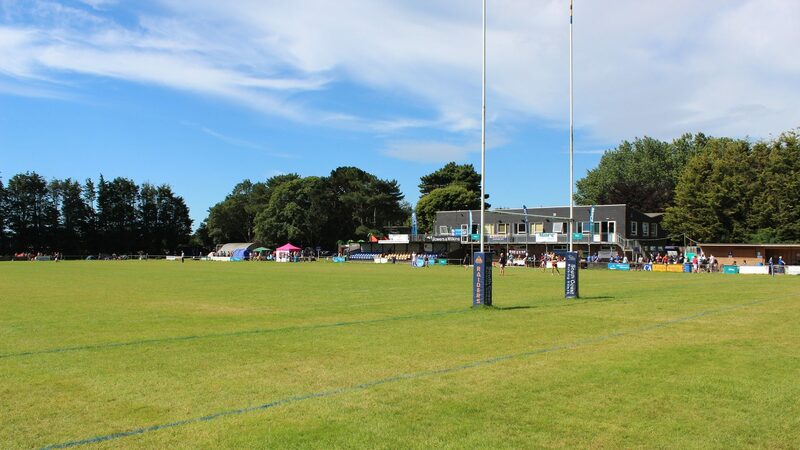 Raiders journey down to Cornwall this Saturday for their sixth visit to play Redruth at their Recreation Ground base. Redruth visited Roundstone Lane last November and were victorious, deep into injury time 27-29. Redruth RFC was founded way back in 1875, the same year as a number of other clubs in the region including Taunton and Plymouth. The club’s centenary tome can be viewed on-line. The ‘Lamb and Flag’ emblem is used by Redruth Council as well as the Rugby club. The mark was originally used on ingots within the extensive tin industry of which Redruth was at the centre. The Rugby club is at the heart of the Town and was considered the top Cornish club for most of the last century. The move to the Recreation Ground in the 1930’s provided a facility for 12,000 spectators (600 seated) and at the time was the third largest rugby ground in England. Fixtures against touring sides were staged. The ‘All Blacks’ played South Western Counties there in January 1973 winning 7-30. ‘Hell-Fire Corner’ must have been electric! Rugby is a way of life to many in Cornwall, especially when Trelawny’s Army get on the march to support the ‘Black and Gold’. An unbelievable 17 charabancs (1500+ crowd!) turned up at Worthing in April 1999 for a county match against Sussex. Cornwall retained the County Championship, this time defeating Cheshire 35-13. As usual most of Cornwall was at the match at Twickenham. The contingent on the pitch from the present Redruth squad were: Brown, Fuca, Marriott (c), Parsons, Vinnicombe, Webber, Williams. The Reds have been in the National League since the system started. Promoted to level 3 in 2005, despite travelling the length and breadth of the country, they remained at that level until 2011. Fixtures with Raiders over the years…..
Worthing visited Redruth in the cup, 1988 & 2004, the home side progressing on both occasions. 2012-13 W27 R26 R26 W22 (Worthing 2nd Redruth 4th).Worthing promoted to level 3 after play-off. Despite the fact that Redruth were 4th in the league (43 points) to Raiders 10th (23 points), the home side came mighty close to upsetting the form book. Angus Taylor slotted the vital conversion with the last kick of the match. An enthralling encounter with the leading changing hands 5 times. The visiting forwards pummelled Raiders’ line for an age before prevailing, deep into injury time, the conversion sealed the match. Raiders:McLean, Loosmore, Coxon-S, Richards, Forrest, Leeming, Peach, Storer, Harris, Burns, Barlow, White, Whittall, Hewick, Smith. Bench: Gatford, Sargent, Squire, Montgomery, Pickford. Scoring-Tries: McLean (2), Sargent, Hewick. Pens McLean. Conversions McLean (2). Redruth: Rule, Vinnicombe, Webber, Parsons, Dicker, Matavesi, Taylor, Phillips, Gidlow, Williams, Buzza, Hattam, Chapman, Fuca, Marriott. Bench: Tompsett, Wright, Howe, Nonu, Bonds. Scoring-Tries: Ducker, Vinnicombe(2), Phillips, Tompsett. Conversions Taylor (2). The Reds had another great season finishing 4th with 110pts with 22 wins and a draw. The defeats came at the hands of promoted teams:Cambridge and Old Albanian and away from the ‘Rec’ at Barnes (36-31) Taunton (19-16) and Bishop’s Stortford (47-15). In the threequarters, Webber, Parsons and Rule featured in all but one fixture. In the forwards Fuca, Marriott and Hattam only missed a couple of matches between them. Redruth are riding high: 5th position in the league with 90 points, just 2 points behind Taunton Titans. Once again their home form has been solid, although they have lost to Canterbury (26-34), Taunton (18-22) and Old Elthamians (17-20) at the ‘Rec’. Exmouth gave them a fright before eventually losing 33-32, but they bagged 2 bonus points from their visit. Last week a visit to leaders Bishop’s Stortford resulted in quite a tough encounter before Stortford pulled away to win 32-7. A little more detail on some of the players….. In the backs, Scrum half Jack Oulton has returned, starting in every match since Christmas. Lewis Vinnicombe on the wing has only missed a couple of matches whilst Sam Parsons (capt) has been ever present, sometimes off the bench. Joel Matavesi and Palepoi Nonu have forged a partnership in the centre although last week Parsons/Webber resumed. Alex Ducker who has 24 tries to his credit has not played since early February. Goal kicking duties have generally resided with Brett Rule.